Before we get started on this week’s delectable dish, we have an update to last week’s Bon Appetit Wednesday! post about hot dogs and eating contests. On the fourth of July, in a huge upset, Matt Stonie delighted fans by dethroning the current champion of the Nathan’s Famous Hot Dog Eating Contest, Joey “Jaws” Chestnut. Jaws was going for his ninth straight victory at this long time Coney Island, NY event. Click here to watch all of the heart-stopping action (we debated on using this pun—really). This week’s recipe comes to us from ancient Rome and is the ideal treat for summer. Globuli may not sound like the most appetizing food, but chances are you’ve already tried and fallen in love with a version of these fried cheese curds at a state fair or other festival. Before we get down to the business of cooking, here’s a brief history lesson on globuli. Petronius, a Roman courtier in the first century CE, wrote that the students of his day “learn nothing but, ‘melitos verborum globulos et omnia dicta factaque quasi papavere et sesamo sparsa,’ which in English is, ‘honey-sweetened round globs of words and all things said and done as if sprinkled with poppy seed and sesame seed’.” Apparently, this insult made perfect sense to Romans because students were familiar with the delicious fried food called globuli. We’ve already described how the Romans loved frying dough in our post on the history of doughnuts, Bon Appetit Wednesday! 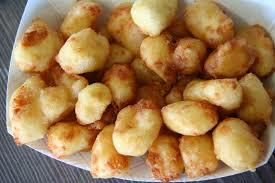 Happy National Doughnut Day, and we’ve also explored their fondness for cheese in our post, Bon Appetit Wednesday! Celebrate an Olympic-Sized Love with Ancient Cheesecake. So it isn’t surprising that they joined their love of fried dough and cheese in order to create a treat that we’ve been enjoying for thousands of years. Mix with the semolina into a loose dough and let it sit for a few hours. With wet hands, form the mixture into dumplings. Quickly fry dumplings in olive oil for a few minutes. Drain and roll in honey. Ancient Foods Today! (n.d.). Retrieved July 3, 2015. This entry was posted in Blog, Bon Appetit Wednesday, Culinary, Culture and tagged ancient cheese curds, ancient food, ancient recipes, AntiquityNOW, cheese curds, fried cheese, globuli, Roman recipes. Bookmark the permalink.